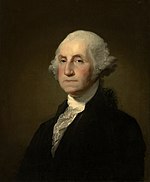 ᏣᏥ ᏩᏒᏓᎾ (ᏣᎳᎩ: Jaji Wasvdana; ᎩᎵᏏ: George Washington; ᎧᎦᎵ 22‚ 1732 – ᎥᏍᎩᏱ 14, 1799) ᎢᎬᏱ ᎠᎺᎵᎨ ᎤᎬᏫᏳᎯ ᎨᏎᎢ. ᏣᏥ ᏩᏒᏓᎾ is a stub. You can help Wikipedia by expanding it.